Below is the opinion article published in USA Today by a distinguished analyst of US foreign policy. The relationship between nuclear energy and nuclear weapons is crucial to an understanding the broader the nuclear issue and the threat of radiation. Japan was one of the last countries to sign the Nuclear Non-Proliferation Treaty in 1970, and finally ratified it six years later only after the United States promised not to interfere with Tokyo’s pursuit of independent reprocessing capabilities in its civilian nuclear-power program. Shimoda’s comments reflected the widespread sentiment in the ruling Liberal Democratic Party that Japan should not foreclose its nuclear option, and that it was time for the Japanese public to get over the trauma of Hiroshima. Japan did finally ratify the treaty in 1976 after protracted negotiations with the International Atomic Energy Agency and the U.S. 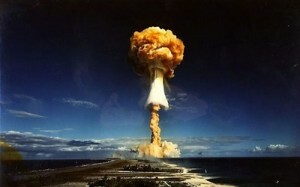 The IAEA accepted a safeguards agreement that limited its inspection to “strategic points” in the nuclear fuel cycle. Equally important, the Nixon and Ford administrations gave assurances that the U.S. would not interfere with Japan’s acquisition of plutonium and its development of an autonomous fuel cycle. Under the 1968 Japan-U.S. nuclear cooperation agreement, the U.S. provided the enriched uranium used in Japanese reactors. Japan had to get case-by-case U.S. approval in order to have the resulting spent fuel reprocessed in Europe and to build its own reprocessing facilities and breeder reactors. As Japan had feared, once it ratified the treaty, the U.S. promptly reneged on promises not to interfere with the plutonium program. Invoking the 1978 Non-Proliferation Act, the Carter administration pushed Japan to abandon its plans for an autonomous nuclear program and to rely instead solely on U.S.-supplied uranium to operate its reactors. Japan successfully resisted American pressures during the Carter period. Then President Reagan went even further than Nixon and Ford to accommodate Japanese wishes, agreeing in 1987 to a revised nuclear accord that gave blanket American approval in advance for Japan to reprocess U.S.-origin spent fuel during the ensuing 30 years. This accord comes up for renewal six years from now, time enough for the United States and Japan to reassess how to make Japan’s reactors safer, whether so much dependence on nuclear energy should continue to govern Japanese policy, and whether the U.S. should continue to encourage such heavy dependence given the lessons of the present tragedy. Selig S. Harrison is director of the Asia Program at the Center for International Policy.